I'm looking to get some feedback on my boiler room piping layout. Anything overlooked? Suggestions for improvement? 1) I'm not using the buffer tank for hydraulic separation because I already have a Caleffi hydraulic separator, and I also want the ability to bring the tank online as needed. 2) The mixing valves on each zone may disappear once I figure out exactly what I'm doing with the last zone (hence why it doesn't show any connection at the moment). This is sort of a worst-case scenario, at least in terms of cost. You don't need a mixing valve at the mod/con. What type off emitters? If the required SWT is within 10-15* for each zone, then you probably won't need mixing valves on each one. The boiler's control can be setup to provide the correct SWT for all of them. Look like maybe a 3 way zone valve to select heating or DHW with a single pump. Be sure to use a high Cv valve. I'd skip the separator, I think it will conflict with flows and may blend return to the boiler up? We would need to know all the zone flow, and boiler flow rates to predict those mixed temperatures. I see it now; I looked at it too quickly and thought the OD sensor was going to it. I'd recommend 2 circs instead of a zone valve. They're more reliable and can be sized/adjusted separately to maintain the needed flow rate. That's correct - 3-way zone valve. The best I could find in terms of Cv was a Belimo valve, which has a value of 8.0. I like the simplicity of using a diverting valve, but I see your point regarding independent flowrates for heating & DHW. I think it will conflict with flows and may blend return to the boiler up? 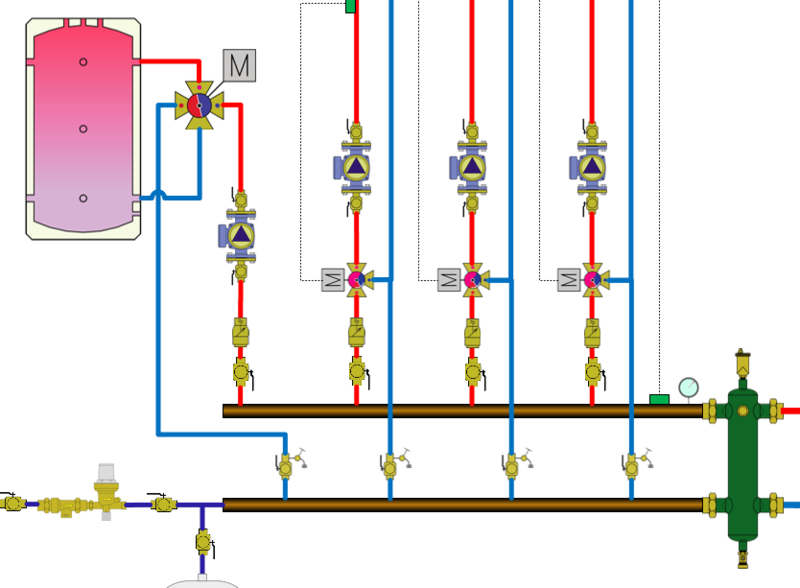 Unless the primary and secondary flow are identical in a sep, there will be temperature blending, so the boiler may not see the lowest possible return, depending on the various flows. how will you control the buffer circ, when does it run? Anytime it runs you lose stratification. a two or 3 pipe buffer alone I think would give you the best of all worlds. What size boiler, and type. The 8 mCv valve should not offer much pressure drop if below 10 or so gpm. When the indirect calls, give it all the flow the boiler can handle for fastest recovery. I was tentatively going to tie the buffer circulator in with a few of the smaller zones I have through trial and error. But I've also been toying with the idea of doing a control that is based on actual short-cycling events (something like a minimum run time and/or boiler SWT rise-rate). Not sure I could do it with all off-the-shelf components though, so that's less than ideal if I ever sell the house. I'm using an HTP UFT-80w boiler. 10:1 TDR gives me ~8k Btu/hr, and with a 3 gal heat exchanger I really don't need a huge amount of buffering capacity. I have tentatively selected a Heat-Flo 22gal buffer tank. How much practical stratification can you get in a tank that's only 2' tall? To take a step back, one of the reasons I didn't originally go with a more standard buffer tank configuration, is that I'm still not 100% convinced that I will actually need one. Since they are relatively expensive, and since I already have a hydraulic separator on hand, my goal was to design and build a system that can function perfectly well without a buffer tank but with provisions to include if necessary. In this case, I can leave stubs coming off the hydro sep with ball valves on them and easily pipe in a buffer tank with almost no down time. This was alternate version I was looking at, with the buffer tank on the distribution-side of the hydro sep and a 4-way diverting valve to both fill and deplete the buffer from the top port. The LLH is not necessary with that boiler. What type of heat emitters do you have? Think you are making it too complicated, and expensive! You have a lot of dual function equipment in those drawings. What are the sizes of your various zones, and how many. Temperature requirements? We can put some numbers to it and see if the juice is worth the squeeze. If zones are within 10- 12° SWT requirement, that is close enough, no need to add additional mixing components. Outdoor reset on supply from the buffer would be an off the shelf solution to many of your goals, no need to build a custom control. All of the emitters are floor radiant. Some above sub-floor with HT plates, some thin slab over-pour. I had included the mixing valves in my original diagram because I was looking at adding a high-temperature zone for the garage. I have since crunched the numbers and it's much cheaper to just use a dedicated forced-air gas heater. My SWTs are within 10°, so disregard the mixing valves. This is as straight forward as it gets. Pipe indirect off the top, or bottom, and heating off the opposite. Use the UFT to its full potential. If you can, combine some zones, and skip the buffer tank. Stub a buffer in just in case if you want. The question would be how often that small zone would be calling all by its self. Or any zone below the low modulation. 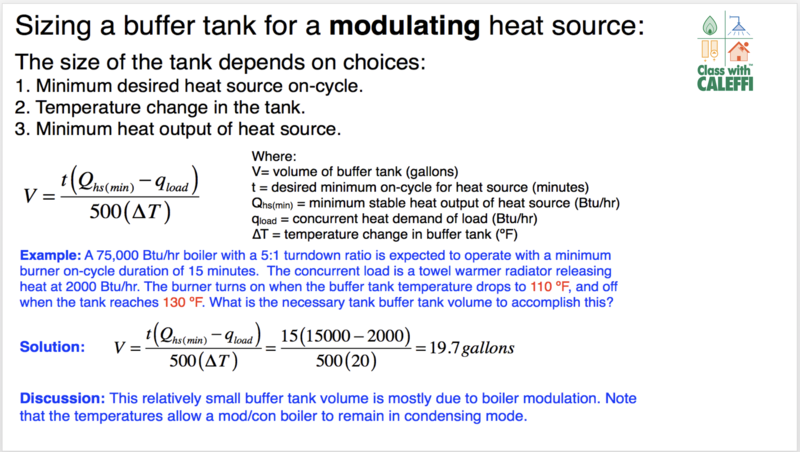 Here is the formula to size buffer tanks for modulating appliances. Plug in you numbers and some options. Min mum 10- 20 minute run every time the boiler fires would be a suggestion. The question would be how often that small zone would be calling all by its self. Exactly. I really see no good way of accurately predicting this, hence my desire to have the option of easily adding a buffer tank after the fact. I'm confident in my buffer tank sizing. The 22gal tank can take 100% of the boiler min fire load and meet the run time requirements, whilst only raising the tank temp 15°. In response to Gordy's comments: I've read a couple of posts on here about people having issues with air removal when piping according to the HTP manual. Having said that, if I were to use another circulator instead of the 3-way diverter valve, I could plumb the DHW off the top and put the DiscalDirtmag in that loop for air removal. I wanted to have air/dirt removal in the DHW loop anyway for the summer months when the hydro sep wouldn't be active. It seems everyone is pushing for piping direct. Since I already have the hydro sep, I'm inclined to use it -- if for no other reason, it at least provides air and dirt separation. Or am I missing something here? You can use the hydro sep. just not necessary. Especially with that boiler. The uft 80 is suppose to be able to take flows down to 1gpm at minimum modulation. Using the hydro sep adds an additional circulator also. The whole idea of a hydraulic separator is so the boiler loop can have its own flow, and the system loop have it’s own flow with out interference of each other. The additional functions are making good use of the vessel, and it’s location. With your system I doubt you would exceed 8gpm, or see 1gpm. Chances are for only one zone to call pretty minimal. Nothing wrong since you own it. It just isn’t necessary if you had to buy one. The separator and piping does add a few more gallon capacity to the boiler and gives a bit more buffering. I'd be inclined to try the sep without the tank as it does give you 4 critical functions. So it comes down to some actual run time and data collection to confirm run times on zones at various load conditions. a cataloguer monitoring all zone run times for a season would give you some accurate numbers, but loads change. And it is possible to over- think a system. Heating systems spend their entire life in a transient stage, just when you think you can predict their behavior, thing probably beyond your control change. I suppose it comes down to how good is good enough. This is all really great information. Thank you guys for your contributions. Looking at another person's plan helps others like me to work out details for our systems.